In order to reintegrate the thousands of refugees living in the diaspora and to reach lasting peace between the different factions in Syria, the country will have to focus its attention on transitional justice. Syria will have to concentrate its efforts on implementing effective, proven international laws and building solid, democratic public institutions based on these laws. The Syrian civil war erupted in 2011 between forces loyal to President Assad and rebel forces demanding political freedom and an end to corruption and the high unemployment the country was suffering at that time. To exacerbate the problem, in 2007 – 2010the country had also been suffering from a severe drought, which resulted in an estimated 1.5 million Syrians relocating from rural areas to towns and cities, causing an additional strain on resources. Since then, the Syrian population has faced war, genocide, terror and sectarian violence. The power struggle between Assad’s forces and the rebels left a power vacuum in various parts of the country, which ISIS and the remnants of al-Qaeda were able to exploit. As a result, local inhabitants became the unwilling combatants in a civil war and what turned out to be an international war on terror. This untenable situation attracted the attention not only of regional stakeholders such as Turkey, Iran, Iraq and Saudi Arabia but also of international stakeholders such as Russia, France and the US. Since 2011, the war in Syria has cost over 465,000 lives and billions of dollars. As the US withdraws its ground troops, claiming the defeat of ISIS, Syria is left in a precarious position. There are still an estimated 30,000 ISIS fighters in Iraq and Syria and its ideology lives on in the diaspora. Many of those that have left Syria and Iraq have gone on to exploit other power vacuums in Libya and Yemen. Furthermore, the political and economic situation in Syria is far from stable and there are still thousands of refugees living in camps across the border in Iraqi Kurdistan and Turkey. 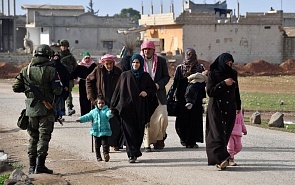 According to a BBC article published in September 2018, an estimated 6.6 million Syrians were still internally displaced at that time. Currently then, the conditions Syria have not changed sufficiently to prevent a further genocide. It could be argued however, that this presents the country with an opportunity for self-reflection. Perhaps it is time for Syrians to ask themselves what they want their country to look like in 50 years’ time; what kind of role they want to play in the Arab world, much as Egyptians did after the Arab Spring. They have the possibility to design and implement wide-reaching reforms across their education system and the economy to help them achieve this. One thing is clear though. In order to reintegrate the thousands of refugees living in the diaspora and to reach lasting peace between the different factions in Syria, the country will have to focus its attention on transitional justice. In order to avoid a fate similar to that of Iraq, Syria will have to concentrate its efforts on implementing effective, proven international laws and building solid, democratic public institutions based on these laws. The country will also have to devise and implement rehabilitation and reintegration programmes as well as tackle the key underlying causes of extremism; poverty, unemployment and political exclusion. ​ It is my hope that Syria will learn from Iraq’s mistake in this area and avoid a prolonged political and economic crisis. Finally, those international stakeholders that have played a role in the conflict since 2011, will have to pledge their support to help Syria rebuild its nation post conflict. The international supervision of judicial reforms for example will be crucial in avoiding internal recriminations and claims of bias. This in turn will aid the transition from a country of war to a country of stable, democratic institutions backed by the wider international community.